For more than fifty years, led by agencies of the United States government, America’s leadership has waged a war on illegal drugs, even as demand for them has increased among American consumers. The war on drugs has exacerbated racial divides, created a criminal element in many nations which sometimes possesses more power than the corresponding national government, and has cost American taxpayers up to $51 billion annually. American agencies which have been active in the war on drugs include the Army, Navy, Air Force, Coast Guard, CIA, NSA, FBI, DEA, INS, and many others. And that’s just at the federal level, local and state police departments and investigative agencies have also been heavily involved in the largely futile attempt to control illegal drug trafficking in the United States. Officially the United States government’s War on Drugs was launched by President Richard Nixon as part of his law and order campaign. After the law and order President was forced to resign having been caught breaking the law, it was continued with varying fervor by each of his successors. Global commissions and initiatives were established with international trading partners and allies and in 2011 one of these, the Global Commission on Drug Policy, including as of this writing 22 members from around the world, declared that the War on Drugs was a failure, and recommended a different approach to controlling the use and movement of drugs around the world. 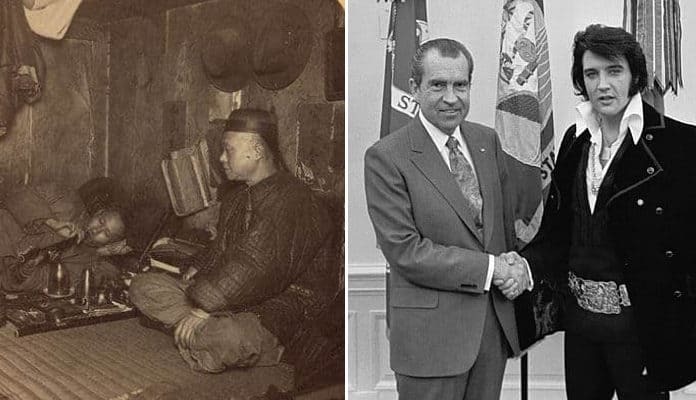 The American policy originally defined by Richard Nixon in 1969 demanded “eradication, interdiction, and incarceration” of drug traffic and those who participated in its supply and use. The attitude has been the basis of American drug policy ever since. Here are some facts regarding the decades long war on drugs and the effects it has wrought on American society, the economy, and the political stage. For most of America’s first 150 years of existence, drugs were not regulated by the federal government. Cocaine was a common ingredient in patent medicines, used as a pain reliever and as a stimulant. Coca-Cola, originally marketed as a tonic, contained extract of coca leaves. In 1895 Bayer, a German drug company, marketed a derivative of morphine as a pain reliever under the trademarked name heroin. Morphine was a component of numerous drugs and patent medicines, obtainable from pharmacists and apothecaries without the need of a prescription, what would in a later day become known as over-the-counter. A mixture of opium and alcohol, which contained the alkaloids morphine and codeine, was sold as laudanum, a popular tonic and pain killer. It was often used to treat colds in children. Opium was smoked in many cities, with both brothels and opium dens offering the drug to their patrons. Local governments often passed ordinances which banned its use, as well as brothels, but the community leaders and police could often be found as clients of the opium dens. Marijuana, which has a long and complicated history in the United States, was found as well. During the age of prohibition, marijuana and other drugs saw an increase in consumption in America, as did both morphine and cocaine. The federal government’s first action against drugs came in 1906 when it passed legislation which made it mandatory for patent medicines and other elixirs to accurately label their contents. The temperance movement and the prohibition of alcohol backers were strong opponents to the opium dens and illicit marijuana use, but there was little public demand to control the use of narcotics in the United States.